Bermuda Yacht Services will be standing by to assist you with all your needs while in Bermuda. Mark - the owner / operator of Bermuda Yacht Services - along with the help of Deborah and Sandra Soars (known to many as “Mama Soares”) continue to expand their work capabilities in order to facilitate their ever growing loyal market clientele. They have become Bermuda’s premier yacht service provider and manage the new Superyacht dock in St.Georges. As a commercially endorsed RYA Ocean Yachtmaster, Mark also holds a Bermuda Marine and Ports engine drivers license and pilots license; and has an intimate knowledge of the yachting industry in Bermuda. They offer a broad range of services including berthing, duty-free fuel bunkering, provisioning, and parts sourcing, where they will bring the parts direct to the boat even if they are out at sea. Customs clearance is available, co-ordination of all repairs / maintenance work, phone rentals, transportation and island tours, hotel / travel arrangements, yacht guardianage, haul out services, immigration assistance, diving / towing services, local knowledge / pilotage, laundry, floral services and a whole lot more. We received numerous enthusiastic reports from Captains and crew last season for Sandra and Mark’s first class service - being the perfect ‘one stop shop’ for all the assistance any yachts visiting Bermuda may require. 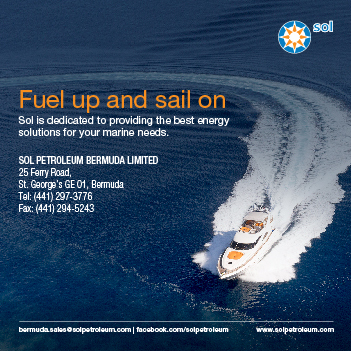 Contact them for any request for marina bookings or special arrangements during the Cup Events. Bermuda Yacht Services - staffed by the ever helpful and friendly Sandra aka “Mama Soares”- not only oversees all your shoreside logistics but also manages the St.Georges Superyacht Dock, where they can accommodate vessels from 30’ through 300’+. They can provide dockage facilities with 110V shore power, potable water, showers, waste disposal, yacht concierge services and they have a crew lounge, which offers free Wi-Fi Internet as well as a place to relax off the boat. Your guide is our 'life saver'... wherever we happen to be. All our crew call it their Bible!